A cluster of baby deaths at the same NHS trust will be investigated, Health Secretary Jeremy Hunt has said. BBC News has learned of at least seven deaths later deemed as avoidable in less than two years at the Shrewsbury and Telford Hospital NHS Trust. A failure to properly monitor the baby's heart rate was a contributory factor in five of the deaths. The trust said improvements have been made - and that their mortality rates were in line with the national average. Mr Hunt has asked NHS England and NHS Improvement to review a series of deaths and other incidents at the trust, to ensure they were properly investigated. He has also asked the trust to contact each family affected. The BBC has uncovered at least nine suspicious deaths at the trust between September 2014 and May 2016. Seven of the deaths were avoidable, according to inquests by the local coroner and legal action against the trust. Two were never properly investigated by the trust, according to the families. There was another avoidable death in 2013. A monitor used in hospitals, called a cardiotocograph or CTG, can give an indication of how the foetal heart rate is responding to the stress caused by the mother's contractions. The technology has been in use for decades but errors are still made. Sometimes, the mother's heart-rate is mistaken for that of the child. "Mistakes are uncommon but they do happen," says Cathy Warwick, chief executive of the Royal College of Midwives. "It is something we have to avoid. Unfortunately, we are still seeing mistakes being made, though we have been training midwives and doctors in this technique for a very long time." The Shrewsbury and Telford Hospital NHS Trust delivers about 4,700 babies each year. Its maternity services were severely criticised last year in an official report following the death of a baby in 2009. The parents of Kate Stanton-Davies had to fight for seven years to get the trust to accept its failures had contributed to their daughter's death. An NHS England commissioned investigation found there was a "lack of a safety culture" at the trust in 2009, that they had not held any staff accountable for the failures in relation to Kate's death, and that lessons had not been learned. A separate analysis of all NHS trusts in England last year rated Shrewsbury and Telford as one of the worst in the country when it came to learning from mistakes and incidents, describing the trust as having a poor reporting culture. Kate's parents, Richard and Rhiannon, have written to Jeremy Hunt calling for a public inquiry into the continuing failures at the trust. "Look at the failings, learn from them, move on," said Rhiannon. "To not do that, they haven't just killed my daughter, but they have disregarded the value of her life, her memory. 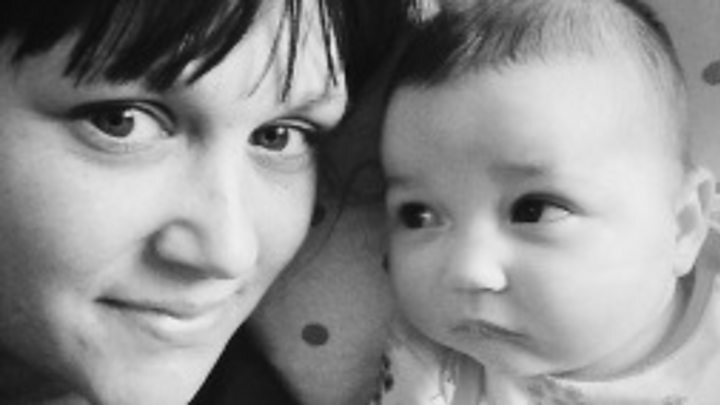 "I personally am aware of another baby that died last year, avoidably, and it causes me pain and sadness on an ongoing basis that her daughter died when she should have lived because learning should have come from Kate's death. "And I feel almost responsible for that because I haven't fought hard enough." The medical director at the Shrewsbury and Telford Trust, Dr Edwin Borman, told BBC News the trust was no worse than anywhere else. "When I look at the perinatal mortality rate at our trust compared to the rest of the NHS, we are at an equivalent level to the rest of the country," he said. "In the case of foetal heart rate monitoring, we have identified a number of cases where learning has not been fully implemented. We've put systems in place to make improvements. "Nationally there has been an initiative called Saving Babies' Lives that recognises that throughout the NHS this is a challenge." The trust has asked anyone concerned about their maternity services to contact them on 01743 261691. The Department of Health said the investigation would examine "disclosures that in a number of tragic cases standards of care fell far below those that parents would expect".